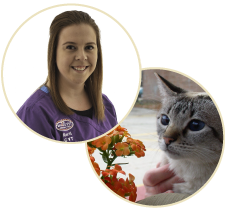 Karli joined Whole Pet in 2015 and has been a certified veterinary technician for the past 4 years. She is very passionate when it comes to working with patients and feels very lucky to be a part of such a wonderful group. Karli enjoys reading, music, cooking and baking, and playing the violin when she’s not at work.